Focus Factor boasts having over forty (count ’em: FORTY!) ingredients in its 4-tablet nootropic formula. As if that’s a good thing! For the record: 40 ingredients is not a good thing. Not to say that the ingredients are individually bad or ineffective. In fact, many of these nootropics comprise some of the best nootropic supplements on the market. The only problem is: Focus Factor is not one of those supplements. Conclusion: Does Focus Factor Work? 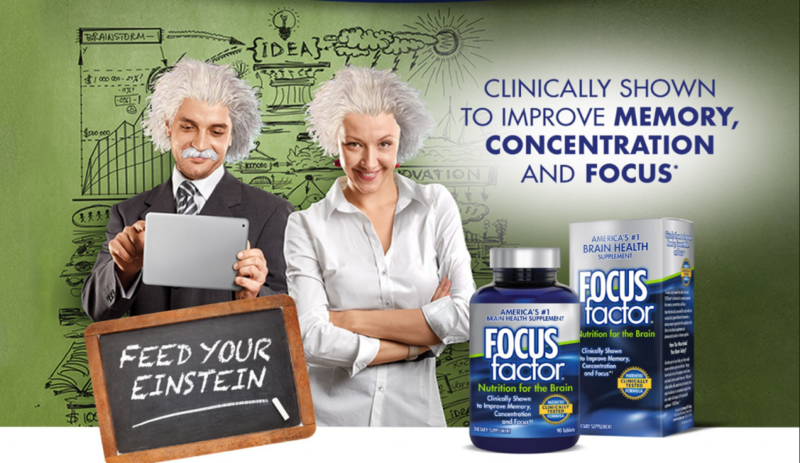 Focus Factor is self-quoted as “America’s #1 Brain Health Supplement,” a statement potentially made true by the numbers. Focus Factor found itself in hot water with the FDA & FTC over deceptive marketing & advertising charges, an issue that maintains its relevancy. Dimethylaminoethanol (as DMAE bitartrate), L-glutamine, Bacopin® (bacopa monnieri extract; whole plant), L-pyroglutamic acid, phosphatidylserine, docosahexaenoic acid concentrate (15% DHA from fish (anchovy, sardine, and salmon) body oil), choline (as choline bitartrate), inositol, N-acetyl tyrosine, bilberry fruit standardized extract (25% anthocyanosides), gamma-aminobutyric acid, grape skin extract and Activin™ (grape seed extract), vinpocetine, Trace-Lyte electrolyte concentrate, huperzine A (extract of huperzia serrata; aerial parts), boron (as boron citrate) and vanadium (as vanadyl sulfate). Suggested Use: As a dietary supplement, take 4 tablets per day with food. To accommodate body weight, activity level, stress level, and/or inadequate tablets per day. I won’t cover every single vitamin & mineral (I REFUSE), but I’ll briefly glance over the important items as well as the general quality & quantity of Focus Factor’s ingredients. Essentially, what you’re getting here is a massive slew of decent quality, well-dosed vitamins & minerals, ranging from the nootropic vitamin B6 (as P-5-P) & vitamin B12 (as ion-exchange resin… wait, what?) to the antioxidant vitamin C, which works as a decent neuroprotector. Zinc & Magnesium also make an appearance, fulfilling the sports nutritional ZMA angle (if you’re at all interested in that). I am suspicious of the amount of ingredient forms allocated to a single ingredient — e.g. magnesium citrate, malate, & taurate for magnesium. It’s almost as if Focus Factor’s manufacturers mixed together the residuous remains of other products hot dog-style, a sloppy approach to multivitamin formulation. All-in-all, I wouldn’t pin this concoction down as a bona fide cognitive enhancer, unless you’re severely lacking in these nutrients. There are 17 ingredients in this 692 mg dosed proprietary blend. That allows a potential average of 40.7 mg per ingredient, although the higher priority ingredients — DMAE, bacopa, phosphatidylserine — are sure to soak up most of blend’s dosage. I’m fine with that, with exception to DMAE, which isn’t the best nootropic. However, it’s doubtful that even these nootropics are receiving enough milligrams to significantly affect cognition given the overall low dosage. The quality of these ingredients isn’t bad and actually impresses in certain areas (e.g. bacopa’s patented Bacopin®, the N-Acetyl form of tyrosine). But the poor design of this blend nullifies any potential benefits of these nootropics. Focus Factor attempts to pack everything into its tablets, in effect accomplishing nothing. There simply isn’t enough space, even in a hefty 4-tablet serving, to sufficiently cover every ingredient in this formula. At least for nootropic enhancement. 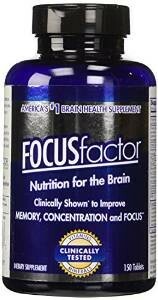 At best, Focus Factor seems to function as a passable multivitamin supplement, although I’d argue that there are even too many vitamins & minerals here than what are necessary. Additionally, there are a number of customer reviews complaining of unauthorized charges from the company when bought directly from the manufacturers. If I had to make a guess, I’d say that Focus Factor crafted together cheap, ineffective pills to sell to (prey upon) the elderly through massive, big-chain retailers for big, BIG money. And, unfortunately, the scheme seemed to work. Focus Factor may pass as a multivitamin supplement, supplying decent quality vitamins & minerals that may support general health to a degree. The nootropics showcase decent quality as well, despite their issues in their quantity & transparency departments. The 40-ingredient formula design is inherently broken: There isn’t enough space in these cheap-o tablets to adequately cover 40 ingredients. Focus Factor has a history of trouble with the FDA & FTC, earned by the company’s blatant marketing & advertising falsehoods. Customer reviews suggest of scammy behavior on behalf of the company as well. Be cautious with your credit card information, y’all! Focus Factor achieved its popularity through aggressive advertising and marketing, selling it’s product through all of the major retailers: Wal-Mart, Walgreens, Amazon, etc. It seems that a lot of people are supplementing Focus Factor, particularly the elderly. You can buy Focus Factor directly through their website (the most expensive option), or through a number of retailers, including Amazon, Wal-Mart, Walgreens, Vitamin Shoppe, and so on. To be fair, Focus Factor carries a number of bona fide, high quality nootropic ingredients. If another company condensed the Focus Factor formula to a 4th of the original roster, honing in on the nootropics that actually work, while foregoing all of the vitamins & minerals, then I’d be very interested to check that product out. Yet, what we’ve been given is a sloppy, stuffed, inefficient product, half hidden by a proprietary blend, falsely marketed by a questionable company, that racks in more money than it deserves. Do I give this product my recommendation? No. Not even as a multivitamin. Instead, go for one of the products on my Best Nootropic Supplements to Buy in 2017 list.